Reporter: Is there anything that would keep you from playing tonight? Kobe Bryant: Are there any snipers in the building? Ever since Dr. James Naismith put the first ball into a peach basket some seventy-five years ago, basketball has been gaining popularity. Stadiums are named after companies, and even video game simulations have salary caps. The game has come a long way indeed, but if you ask me, not necessarily a good way. It is all about the money these days. Players get upwards of a million dollars for simply signing there names on a line, and lately it seems as though the bigger the tattoo, the better the athlete. Where am I going with all of this? Well, look no further than your 1999-2000 NBA champion Los Angeles Lakers. With a team full of egos, a coach with a history of deflating them, and a city hungry for another title, the Lakers were not your traditional basketball team. In fact, the Lakers seem more like a team of desire than destiny. After early exits from the playoffs in previous years the team seemed to gel with the arrival of former Bulls' coach Phil Jackson. After breezing through the regular season with only a handful of losses and at times 20 game winning streaks, the Lakers seemed the likely choice for the title. After going up two games to none on my beloved Sacramento Kings, the Lakers got a serious threat after Sac tied the series for a pivotal game 5 at the Staples center. Game 5 turned out to be a non-event as Shaq and company made quick business of the Kings, and moved on to the Phoenix Suns. A convincing near-sweep of Phoenix set up a showdown with the equally-talented Portland Trailblazers. After one of the best conference finals series ever, L.A. went on to the finals, and a date with the Indiana Pacers. Going up two games to none quickly before heading to the Hoosier State, the Lakers would win the series back home, in the house that office supplies built, The Staples Center. The official finals video is well made, and is essential for the Laker fan in all of us; OK, maybe not all of us. Featuring interviews with the key players as well as the coaching staff, this championship video gets the job done. While I would have liked more behind-the-scenes looks at the life of an NBA team, I suppose that is a subject for another video. Image Transfer Review: Presented in what appears to be a 1.66:1 non-anamorphic transfer (the box makes no indication either way) this is only an average-looking picture. There is a lot of edge enhancement in some of the shots, and there is noticeable grain throughout. Sharpness and detail are fine, and black levels show up well. The footage of the games really delights, as the yellows of the jerseys, and the wood on the court come off well. Overall this is a good transfer, with a few too many flaws here and there. Audio Transfer Review: Shown with a tame Dolby Digital 5.1 mix, the audio has its moments. Crowd noise fills the surrounds on more than one occasion, but that is about it. The center channel produces clean, crisp dialogue, and the left and right speakers sound fine. A Dolby 2-channel mix is also offered. Extras Review: It is in the plentiful extra features department that the disc really earns its stripes. Featuring multiple angles during some of the NBA Finals highlights lets you see Reggie Miller get shut down in various ways. Under the special features menu option, you will find a wealth of information about not only the Lakers, but also other teams. 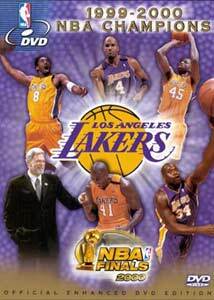 Bonus features on Jackson, O'Neal, Ron Harper, and Kobe Bryant are worth a look, as are the Reflections on the Championship. A game by game results section gives you the final score, leading scorer, and date of every game in the Lakers championship season. Highlights from the celebration parade are shown, but I am a bit disappointed that there are no highlights from the celebration that took place, the night of the final game, in the streets of L.A.. The real treat on this disc is the Top Ten Plays in the NBA. From a wild Jason Williams pass, to Vince Carter flying through the lane on more than one occasion, I have watched this short highlight reel repeatedly. Even though I am not the world's biggest Laker fan—I think that would be Mr. Nicholson—this is a nice disc. And it is also a good step in the positive direction for sports on DVD. How long will it be until we get discs featuring March Madness, or individual team videos? If you are a fan of the Lakers, this is a disc for you; if not, just wait until your team wins a championship. For you Bulls, Grizzlies, Hawks and Wizards fans, you might want to get a book to read because it might be awhile.